The City Pharmacy PNG Lewas started their ICC Women's World Cup Qualifier campaign with a 178 run victory over the Sri Lankan Emerging XI in a practice game on Friday 3rd February at the FTZ Ground in Colombo. Batting first on a hot and humid day in Colombo, the City Pharmacy PNG Lewas posted a mammoth 9/308 off their allotted 50 overs. Norma Ovasuru (71 off 62 balls) and Brenda Tau (55 off 55 balls) led from the front hitting half centuries batting at the top of the order, while Konio Oala (42), Pauke Siaka (41), Tanya Ruma (31) and Veru Kila Frank (21) all made valuable contributions in the middle order. 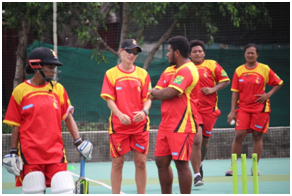 "The positives were batting partnerships," said City Pharmacy PNG Lewas Coach, Cathryn Fitzpatrick. "It was good to see the top order batswomen get starts and going on with it." In reply, the Sri Lankan Emerging XI could not handle the City Pharmacy PNG bowling attack, eventually being bowled out for 130. Sibona Jimmy (3/10) and Ravini Oa (3/15) were the pick of the Lewas' bowlers, both taking three (3) wickets each, while three (3) other bowlers picked up a wicket each. "The bowlers worked well together and the run will do us good in adapting to the conditions," said Fitzpatrick. The City Pharmacy PNG Lewas will be one (1) of the ten (10) teams taking part in the ICC Women’s World Cup Qualifier from the 7-21st February, 2017 in Colombo, Sri Lanka. The tournament will see the bottom four sides from the ICC Women’s Championship along with Bangladesh, Ireland, Thailand, Scotland, Zimbabwe and the City Pharmacy PNG Lewas go head to head for the four (4) remaining spots in the ICC Women’s World Cup in the United Kingdom from the 26th June to the 23rd February, 2017. The ten (10) sides competing in Colombo will be divided into two groups of five with the top three from each progressing to the Super Six stage, thus securing One-Day International (ODI) status until the next ICC Women’s World Cup Qualifier. The City Pharmacy PNG Lewas are in Group B along with South Africa, Pakistan, Bangladesh and Scotland. The top four sides from the Super Six stage will qualify for the ICC Women’s World Cup 2017 as well as for the next ICC Women’s Championship, while the top two sides will contest the final on 21 February. The City Pharmacy PNG Lewas will now turn their attention to Thailand who they will play in another practice match at Moors Cricket Ground in Colombo. "A bigger challenge awaits us against Thailand and we will keep looking to build some momentum into our opening match," concluded Fitzpatrick. City Pharmacy PNG Lewas 9/308 (50) Norma Ovasuru 71 (62), Brenda Tau 55 (55), Konio Oala 42 (36), Pauke Siaka 41 (39), Tanya Ruma 31 (35), Veru Kila Frank 21 (25) defeated Sri Lankan Emerging XI 10/130 Sibona Jimmy 3/10 (5.4), Ravini Oa 3/15 (6) by 178 runs.